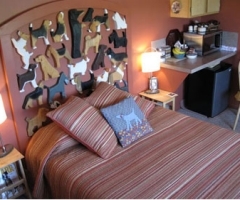 Being in the doghouse is a good thing at Dog Bark Park Inn Bed & Breakfast! 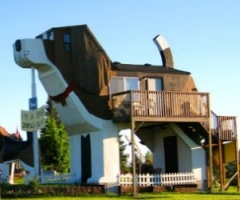 Sleep inside the world�s biggest beagle with all the comforts of home. This bed & breakfast is a dog outside. Inside, it is a charming escape from the ordinary � from the twenty-six carved dogs on the queen headboard to a cozy loft room in the dog�s head, to dog-shaped cookies on the pillow. Breakfast includes home-baked pastries, Prairie�s Best Fruited Granola, fruit, cheeses, yogurts, bagels, and more! Enjoy prairie views and starry nights from the second story deck. 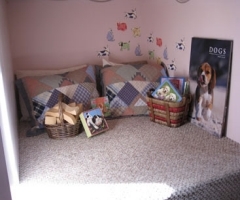 Play a game with your partner or the kids; snuggle up with a book from the inn�s extensive collection of reading materials, games and puzzles. During the day, take a jet boat tour into nearby Hell�s Canyon, visit a wolf center, learn about the Nez Perce Indian history & culture, go horseback riding, or explore around. Idaho�s famous �big dog� is an unforgettable experience. Dog Bark Park is located in north central Idaho on US Hwy 95 at Cottonwood, Idaho. We�re in the heart of the Camas Prairie where wheat, barley, canola, blue grass & hay are the dominant crops. Cottonwood, 924 population & the second largest community on the prairie, has a compact downtown regional medical center, Bureau of Land Management field office& nearby Monastery of St. Gertrude. Dog Bark Park is home to Toby and Sweet Willy, the World's Two Biggest Beagles. Toby, a 12-foot tall beagle statue, was built by Dog Bark Park artists Dennis Sullivan and Frances Conklin. 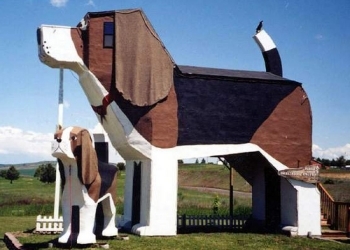 Sweet Willy, officially known as Dog Bark Park Inn, is one of America's latest additions to the type of roadside architecture popular in the early days of automobile vacation travel when travelers would often buy gas, eat meals or stay overnight in a building that looked like something else. Remember coffee pot or teacup gas stations, milk bottle shaped restaurants or the shoe and duck houses? For today's travelers Dog Bark Park Inn offers a glimpse into those bygone days with all the comforts of our modern days.